We are Queen’s Mill Crafts Knit and Knatter Group. We meet every 1st and 3rd Thursday of the Month. We started the group 8 years ago, in 2009, in the local sculpture of the Crate House in Castleford. Claire Pouton and Janice Brooks started the group, they thought it was a fun, good,idea to get people together. We had a few knitting needles and some donated wool. The group meet at Queen's Mill, Castleford, 1 Aire Street, WF10 1JL in the meeting room. We are hoping to move into a brand new Community Room soon, as Castleford Heritage Trust have been redeveloping the site into a community arts and heritage centre. Between 12-20 people meet on a regular basis. We always enjoy welcoming new members. Our first project was Teddies for Tragedies. 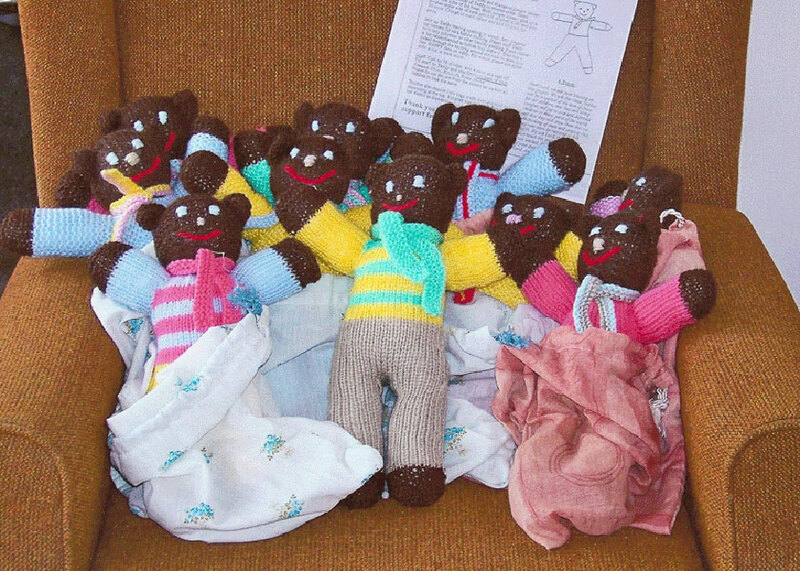 This was a project where we knitted teddies to send to Uganda. We found out that there were some women in Uganda who were in prison, had their babies in prison and they had nothing to give to them to play with. We sent the teddies over to them so at least they had something. This project expanded, as did our group. We became involved in knitting for mothers who were on Death Row in Uganda. We knitted toys, teddies and blankets with the alphabet on so they could teach their children the alphabet. We sold knitting to raise funds so that they could purchase pencils and school books. 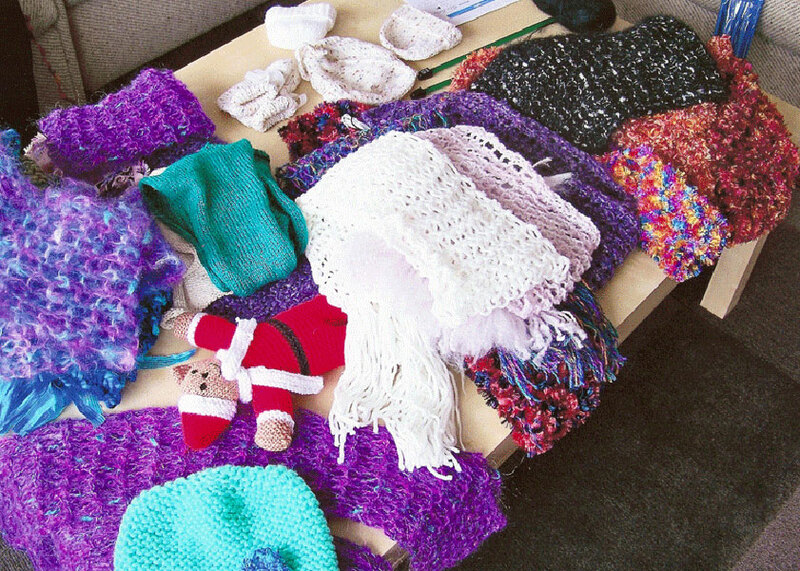 Around the same time we became involved in knitting for premature babies and began to make cardigans, booties, hats and blankets to be given to Pinderfields Hospital Special Care Unit. We started doing this in 2009 and are still involved with this today, taking new items every few months. In 2010 we knitted squares to send to the National Knitting Centre in London who made them into blankets for hospices. The National Knitting Centre were very grateful for our support and we enjoyed being a part of such a wide scale project. Since 2013 we have contributed to Age UK Big Knit project and have made hundreds of hats for innocent smoothie bottles. Funds from this are used to keep older people warm and well. We take part in this project every year. In 2014 we started to make twiddle muffs for Dewsbury Hospital for dementia patients. These are mittens with lots of different sensory textures, such as buttons, zips, ribbons and different kinds of fabrics and are designed to contribute to patients’ wellbeing. In 2015 we knitted Poppies for a local church to mark Remembrance Sunday. 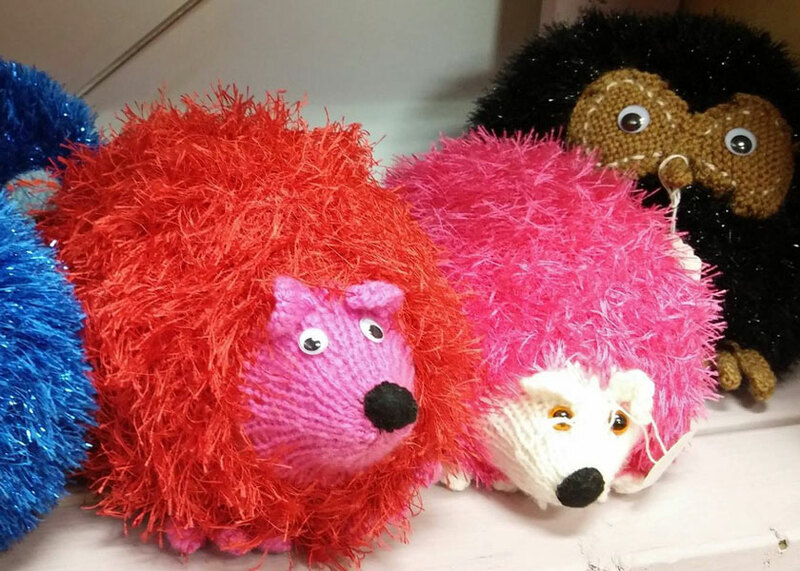 In 2016 we did the Big Knit campaign for our local hospice, Prince of Wales Hospice, Pontefract. We knitted scarves for the project and these were sewn together to go around the building. 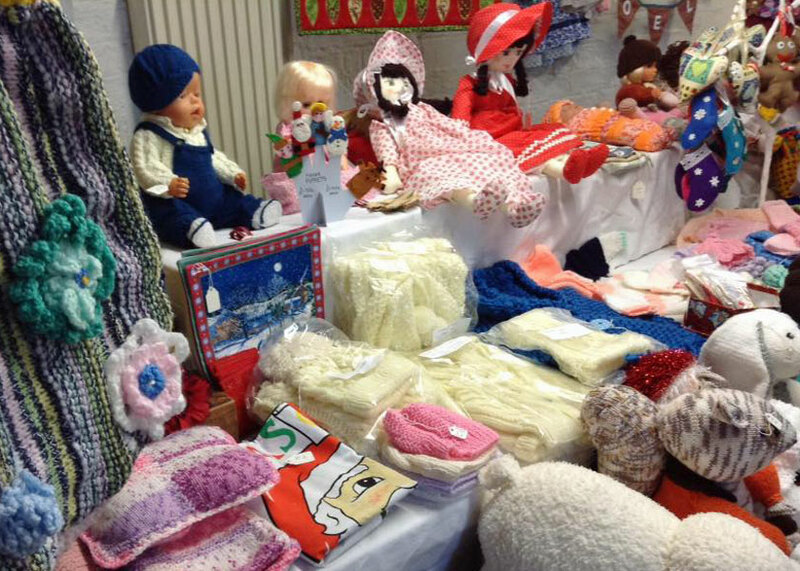 We supply our shop at Queen’s Mill Crafts with toys, bags, cardigans, scarves and Christmas decorations. Most of all we enjoy a good social chatty afternoon together and look forward to meeting each Thursday. If anyone is interested in joining our group they would be most welcome. 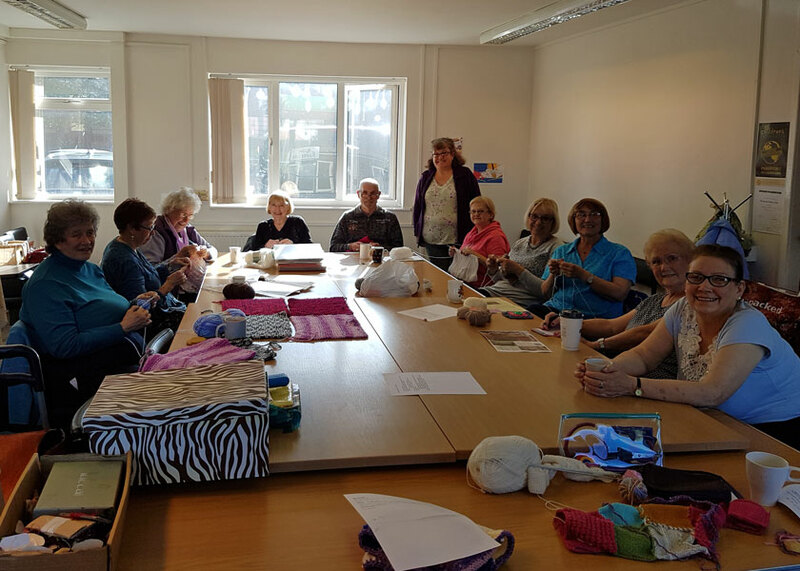 We are on Facebook – Queen’s Mill Knit and Knatter, you can contact Castleford Heritage Trust on 01977 556741 for more information, or just come down, 1st and 3rd Thursday of each month, 1pm-4pm. The best part of the group is meeting new people and enjoying what we do. In three words the group is: Friendly, Enjoyable, Perfect! We take one year at a time and see what projects come up.